I think the next session will be telling of what the market really wants to do. Prices did turn down today but stopped short of the level I am watching to confirm a bearish turn. This sort of price behavior usually points to higher prices, however there is also signs of a coming bearish structure in place so we'll probably get a strong gap down in the next couple of sessions or a gap up to break out of this trading range. 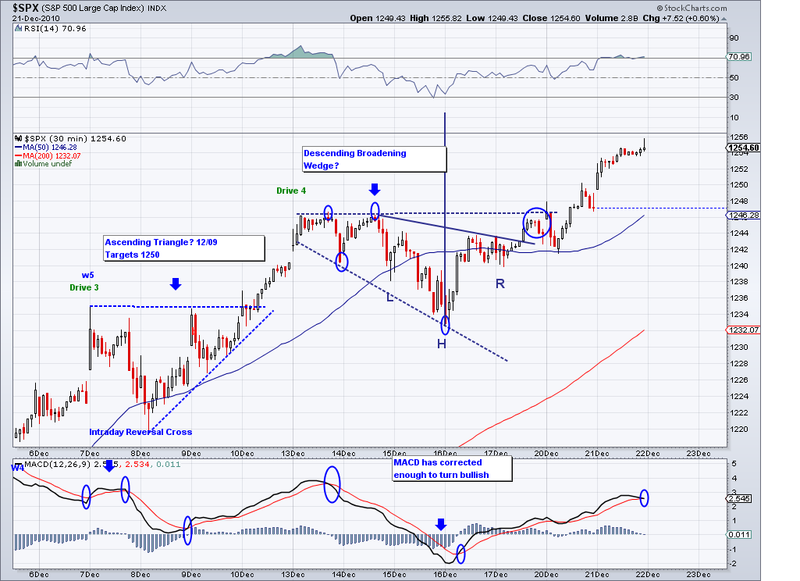 The market is obviously overbought so probabilities favor a sell off sooner rather than later. 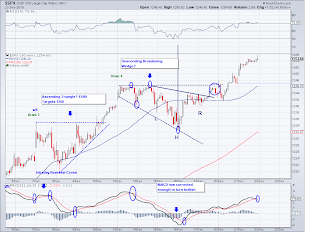 Picking tops is extremely difficult and usually I rely on EW and stock patterns to find the most probable topping patterns that indicate a top. Today there is the possibility that we have reached a short term top but it needs to be confirmed with consecutive closes under the 1253 level. We still have the Inverse Head and Shoulders target of 1269 but we have a rising wedge that broke (found usually on W5) in the last few minutes of trading and a clear bearish cross on the MACD. So tomorrow we'll see if we there is follow thru selling. I am maintaining both my short and long positions. 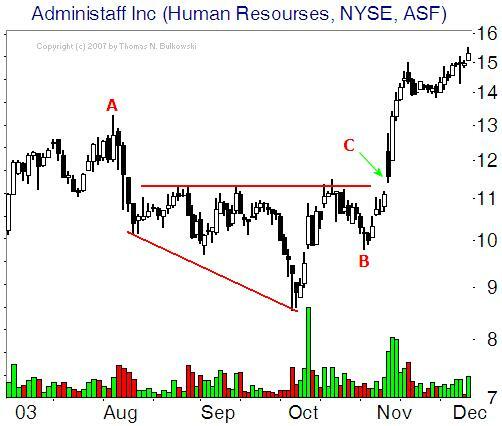 Market is forming an Inverse Head and Shoulders pattern. 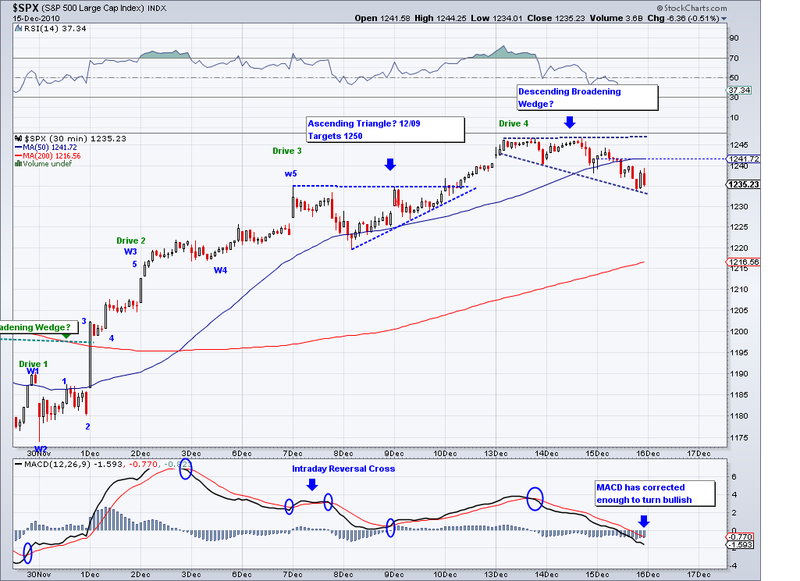 However, if the market can't break thru the 1260 level, we should be watching the DBT pattern lower trendline. 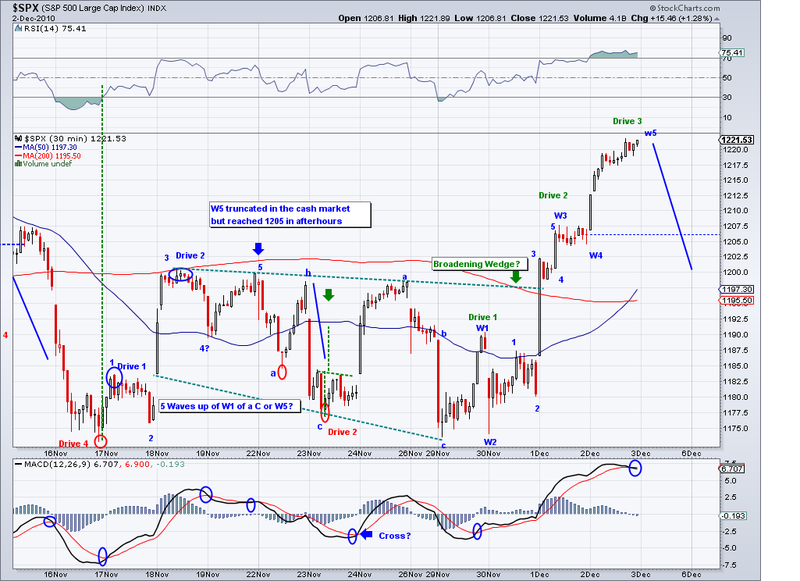 So far trading seems to be corrective with intentions of another push up fairly soon. December 27th - Another Descending Broadening Triangle? The market recovered easily from the early sell off today and the only pattern I see at the moment is another Descending Broadening Triangle. The markings are very similar to the one on 12/14 when I posted the last one so we might see another push perhaps to the 1270-1275 area. It's still too early too tell as the markings are not complete but if the market keeps avoiding key levels and trendlines then it is just correcting in my opinion. 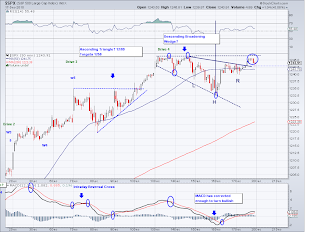 On the Elliott Wave labels, I've honestly lost count but every time we get into a triangle this theory points to a Wave 4 with higher highs to come. I think it would be more bearish of the market gapped up and then reversed as opposed to gapping down and reversing up. So I am staying with my short position until the test of the trendline again, if it bounces again then it means this rally is not done yet. The market did not do much today but it did trade as if it intended to make another push higher. I could have covered my SDS position at break even but I think the rally is about done so I rather miss the upside than the potential downside. I am looking for topping patterns to develop so we'll have to see what Monday brings. We could possibly have an up day on Monday to form the head of an Head and Shoulders formation if the wave is in a W4 count. 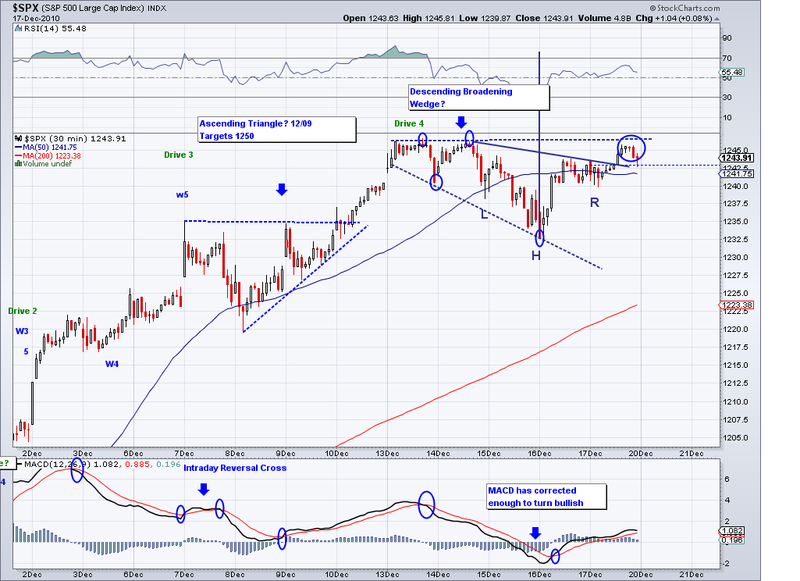 If this is not a W4 then we'll probably see a double top or triple top formation. We did get a short term reversal on the moving averages and that has potential to turn into a bigger reversal but for now I am still assuming higher prices as long as 1246 doesn't get closed under. 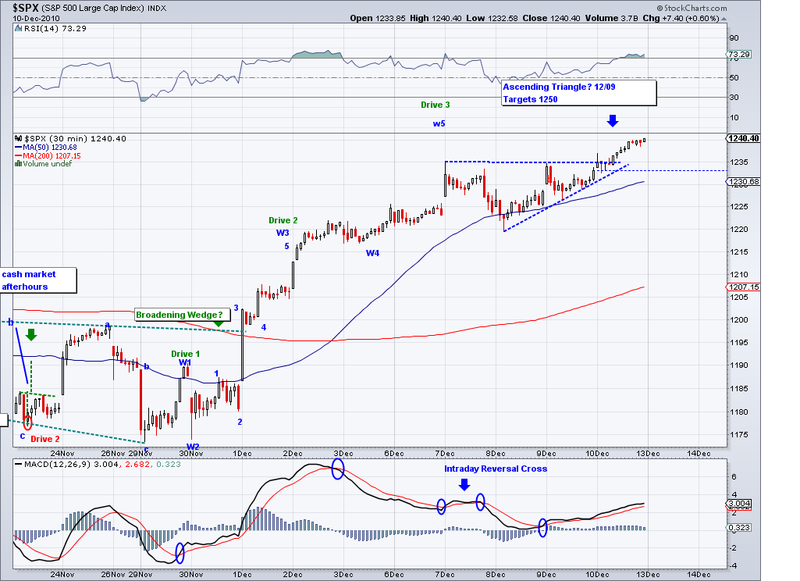 The market kept going higher without a pullback and it basically reached my short term target of 1260. 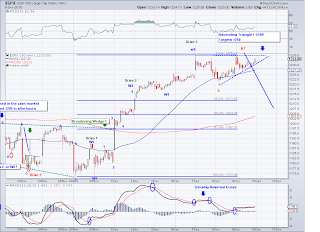 I think the market has enough room to go to 1275 if the coming correction stops at the rising trend currently at 1245. I re-shorted my original position (1212 then stopped at 1230) at 1256 and I will be watching how the correction turns out. If we get a big sell off that takes out that 1245 trend, then I would say the top is in and we're in for a correction of the entire rally from 1040. But if we bounce at that level (just like it did last week at 1232), then 1275 by December 31st. I intend to profit either way from this move, I am keeping my other long positions until any significant trend changes. 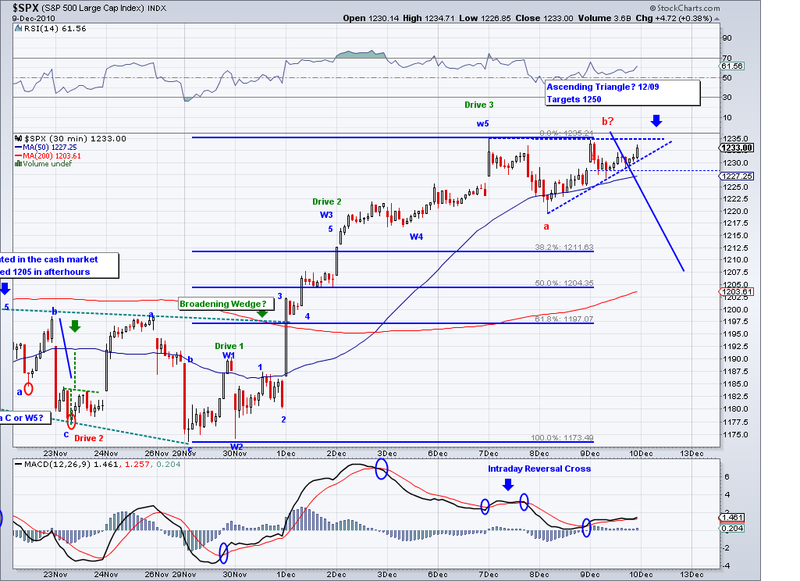 So we got the rally I was looking for this week and we hit the 1255 target. 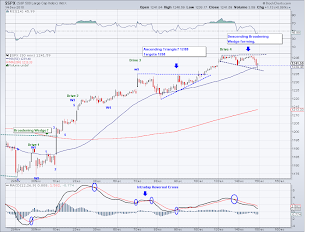 The inverse H&S projection was met today and the price behavior keeps looking very similar to the chart I posted on Descending Broadening Triangles last week (In fact, it is almost identical) and I am glad I was able to indentify the pattern in its early stages. 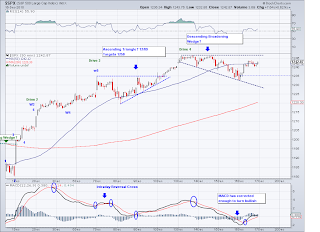 The MACD has however crossed and it is signaling a pullback along with overbought RSI levels. So the rising trendline probably be tested again before going again for another high. That number is 1242 as of today and unless this number is broken and closed under consecutively, I will expect new highs. I have not done any trades as I am primarily waiting to re-enter my short position. And I am keeping my FXI until I see a reasonable spot to sell. Market Update - December 20th - 1250 finally.. I posted the 1250 target on November 30th and we finally reached that number today. The inverse H&S projection from August 31st has now been met but there are still couple of patterns that point to higher prices. I am not posting a chart today because there is nothing new on the patterns other than it is breaking out of the Descending Broadening Triangle as I predicted on Friday. And unless the pattern fails due to some North Korean missile, I think the market will continue to rally towards 1275. It might top before that but how tomorrow and Wed goes should give us an idea. 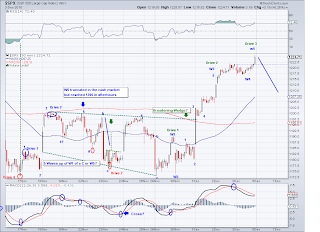 I will be re-shorting this as soon as these patterns and waves are complete. 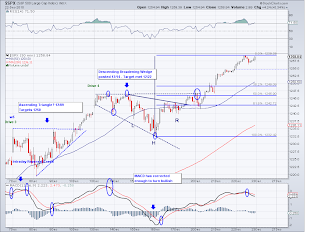 Market action points to a wave 4 with the possibility of a rally coming as soon as Monday or Tuesday to finish up the impulse waves from 1174. The market has respected the Descending Triangle Triangle Trendlines I drew several days ago and now it looks almost identical as the image below. 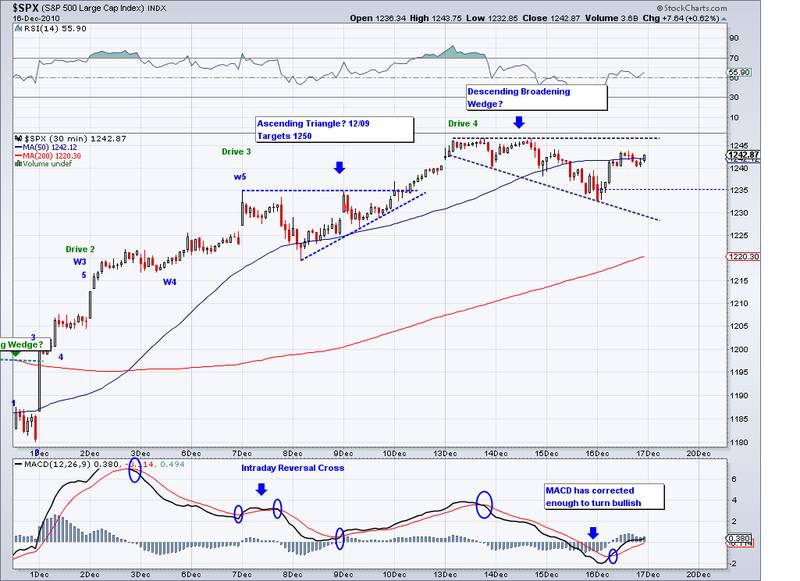 Also, note the inverse Head and Shoulders formation targeting the 1255 area. 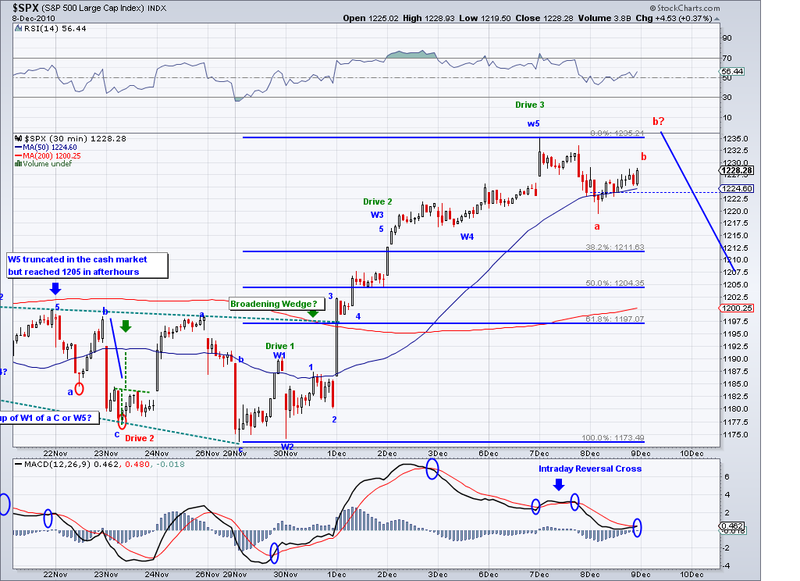 I am assuming higher highs early next week and will use the opportunity to re-short the position I covered at 1230. I guess the 1250 target will be met after all. The market bounced at the level I mentioned yesterday and so far it looks like it was a test of the trendline. And now that the MACD has turned bullish, there is a chance for a lot more upside. We do however have the bearish candlestick confirmation from yesterday but one more positive close would turn the short term trend bullish again. As long as 1234 gets respected, I am expecting more upside to come. We got a bearish confirmation of the candlestick today and the market is right above the level I watch which is at 1232 as of today. 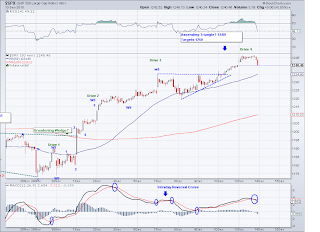 However, we have some indicators like the MACD and the RSI corrected enough and that can point to a sudden rally too. Also, we have the Descending Broadening Wedge so the picture is not all that clear. 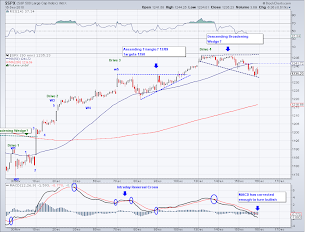 As a trader, I am focusing on the trend and consecutive closes below 1232 would point to a trend change. But until then, I am assuming the trend is just being tested so I am holding off on shorting until I see some confirmation. The Elliott Wave counts I have see are not all that clear either as some point to a W4 and others to the beginning of a sell off. What happens tomorrow and possibly Monday should give us a clear idea of where this is going. But going by seasonality, odds favor further upside. 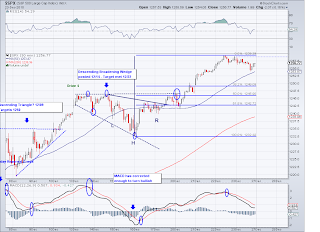 The market refused to pullback today and in the process the left the markings of what seems to be a Broadening Descending Triangle, which is generally considered bullish as prices consolidate before pushing higher. So I covered my shorts from yesterday at a small profit, keeping longs and waiting again for another push up to see if that will mark the top. I guess we'll see 1250 after all and if people get euphoric we might even see 1300 by January 1st. However, for now I am assuming the top is nearby. Market Update - November 13th - Reversal Coming? 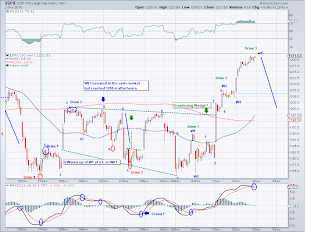 I think the market high today of 1246 satisfies the Ascending Triangle target as well as the Inverse Head and Shoulders projection I posted on August 31st. 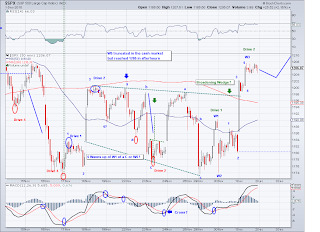 This coincides with what again seems like the end of a 5 wave move and a Shooting Star candlestick pattern. 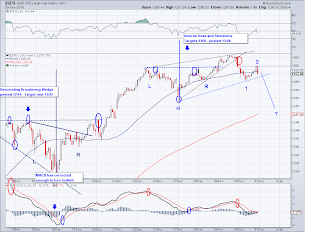 A negative close tomorrow would confirm the start of a bearish trend. However, I am looking for consecutive closes below the 1230 level to call 1246 the top for this leg and perhaps the entire rally from 1040. 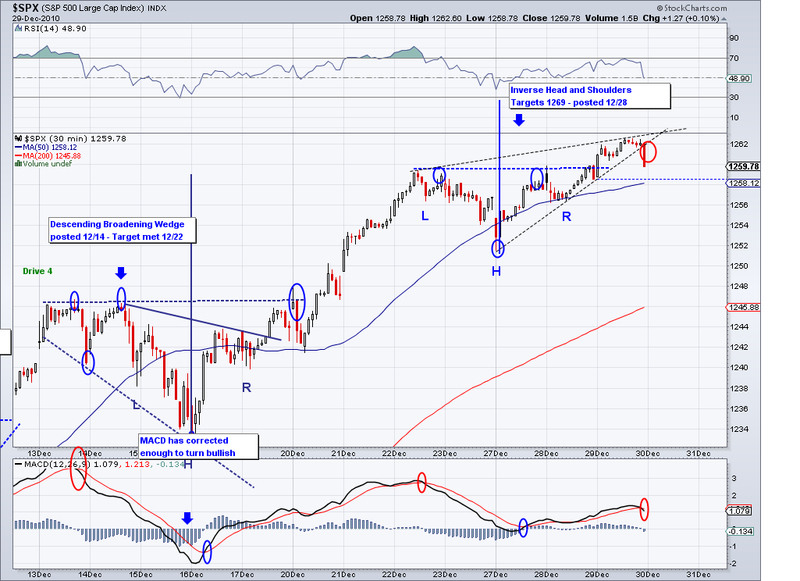 How the market corrects should give us a clue of where we are in the overall picture. There is a good possibility the market is ready to retrace the entire rally from 1040 and right now the 200 MA and 34 EMA look like good support levels. I re-shorted today at 1245 and in the process improving my cost average by 15 points. So technically my cost on my latest SDS position is now 1227. I am keeping my FXI hedge just in case the market wants to go up some more. 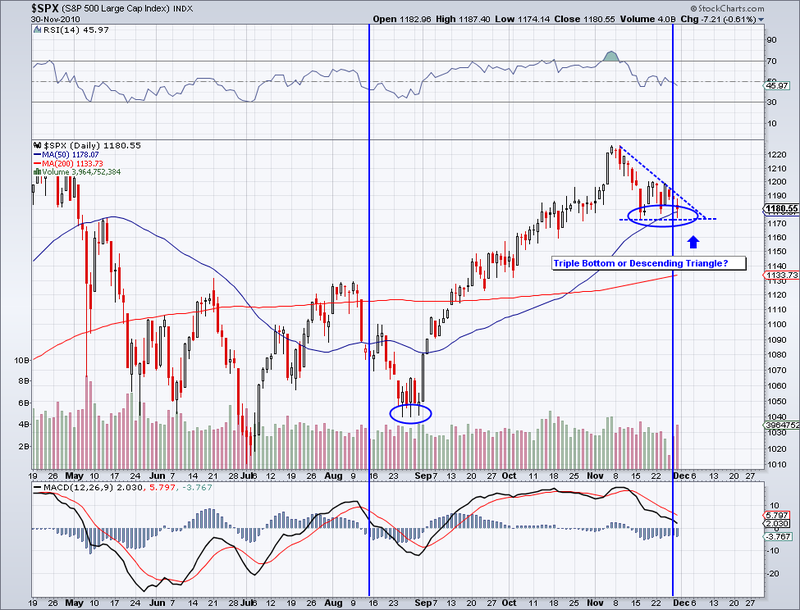 Market did break out of the triangle and I'm going to assume we'll be seeing 1250 soon. Despite being overbought and all the news the market doesn't feel like going down, so no point in fighting the trend. I cut my shorts yesterday but will re-add again possibly Monday or Tues, especially if we get a spike to 1250. I am staying long with FXI for a while so I'll technically be hedged if that level comes. 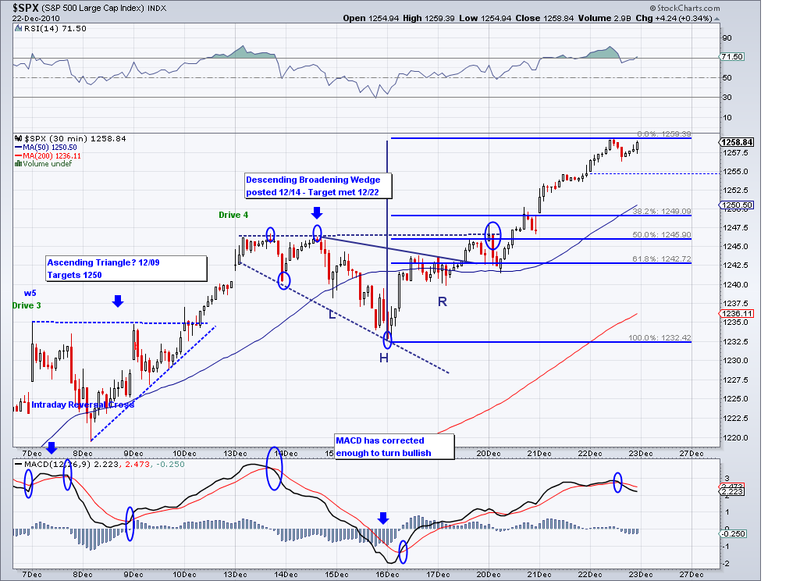 The alternative of course is for the market to do a proper Fib retracement but it doesn't seem likely just yet. 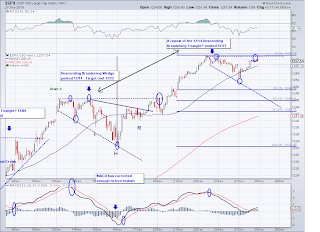 The market is not clear today since it failed to impulse to the downside. And unless it does so tomorrow, the price pattern looks like an Ascending Triangle with a 1250 target (which is the target for an Inverse H&S from 8/21). The bearish confirmation from couple of days ago was essentially reversed today so the trend is neutral leaning bullish. And while there is absolutely no doubt in my mind there will be a proper Fib correction of the wave from 1174 and the wave from 1040, the best option is to assume higher prices. So I pared down my shorts my 80% today since it seems the market might continue up and I am holding my longs. I will re-short again if the Ascending Triangle comes thru. 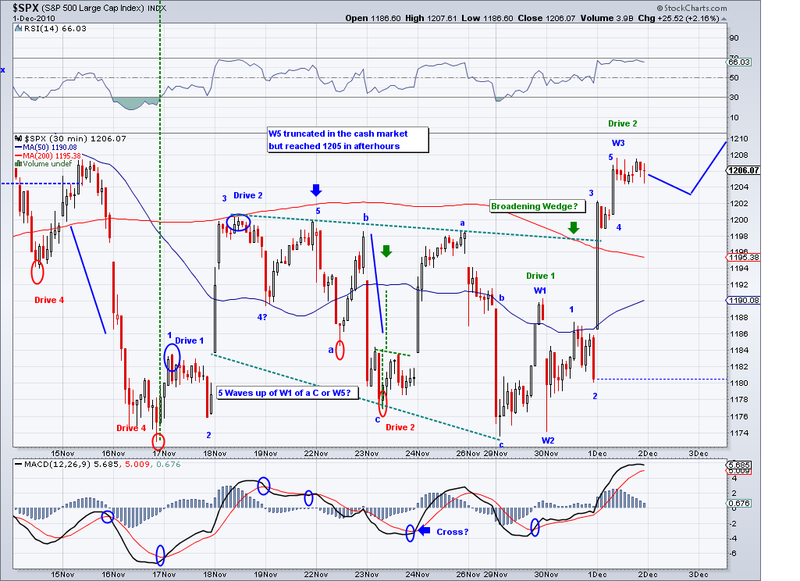 Today's move to 1219 had a 5 wave form and it's indicative of an A or a W1. 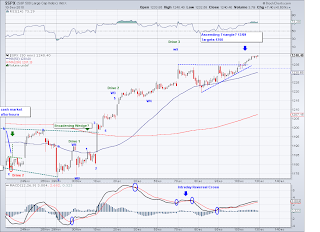 The subsequent move to 1227 seemed to be corrective B wave or W2, how this upswing behaves tomorrow should give us a better idea tomorrow on how to label it. As of now, we had a confirmed bearish short term trend and this is an expected bounce. However, the cross on the MACD yet again to the bullish side can also imply another 10 point+ wave up and we should get the answer tomorrow. I am holding my hedged positions until a Fib retrace which will come sooner or later. On a side note, the cuts in payroll tax, 100% exemption of capital equipment purchases for business and extension of tax cuts is a positive for the economy. So there will be a bullish bias for the foreseeable future, as in the next few months. 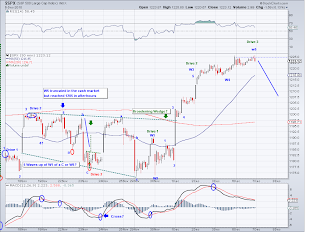 EOD Update: There was a bearish reversal today and I think we've finally entering the corrective phase. The market put in a Black Candlestick, a day after a Doji which translates into a bearish confirmation as far as the Candlestick method is concerned. I think we will see a test of the level posted on the right and tomorrow's 10 year bond auction might serve as a catalyst for a sell off. I am planning on going leveraged long at the first test of this level. Morning Update: Interesting the market hit and seemed like it topped at 1235, which was just one point above the 1234, a Fib mark I had put down for last month. 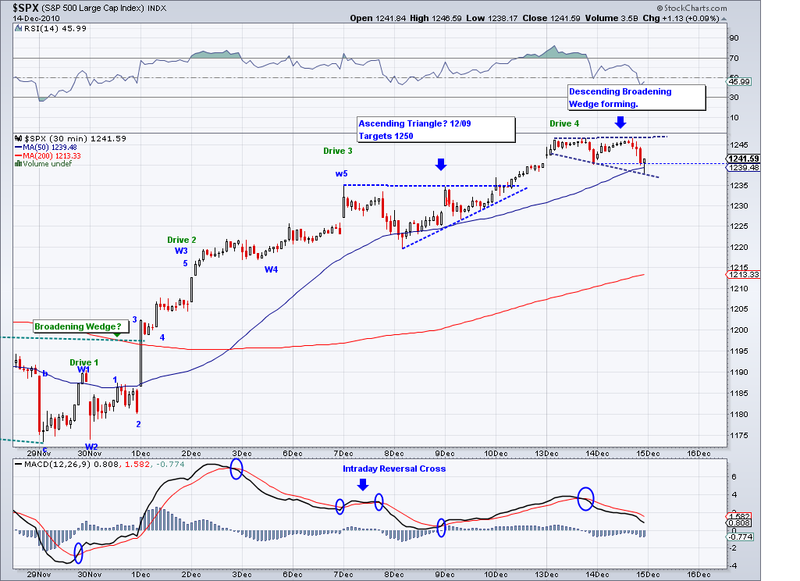 And now it seems like we are are starting an ABC move, note how the MACD has reversed. It's rare to see the MACD in the 30 min frame reverse the same day. Market Update - December 6th - Double Top ? I am still waiting for a retracement to test the rising trendline currently at 1201 (goes up a few points everyday), I see 5 waves completed so the only upside left would an extended 5th wave. There seems to be a lot of resistance at the 1227 in the cash market and it might well put in a double top for this leg at this level. However, it might be just buying sometime to do yet another trust to pull in buyers. I favor a pullback this week so we'll see. I am hedged in my positions and will use the the correction to the rising trendline to go long on margin. 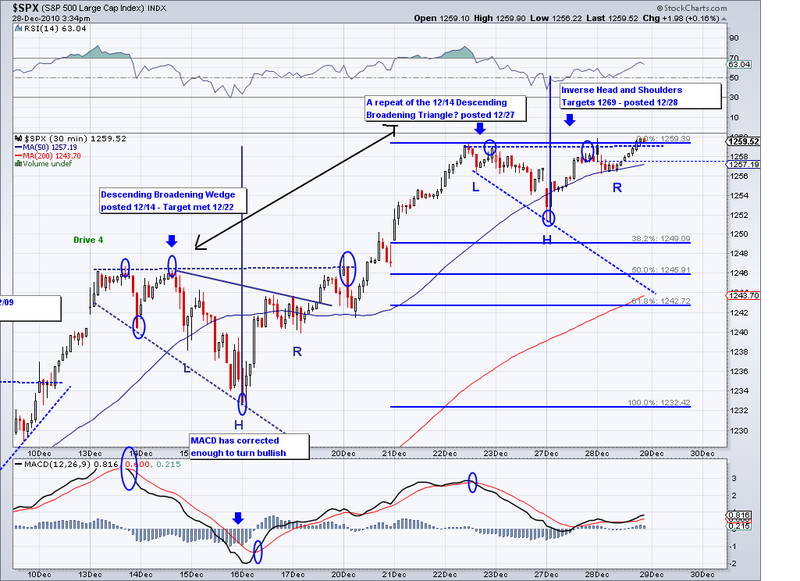 I was reading today that Goldman Sachs is forecasting 1450 for 2011 and that is one company I pay attention to. 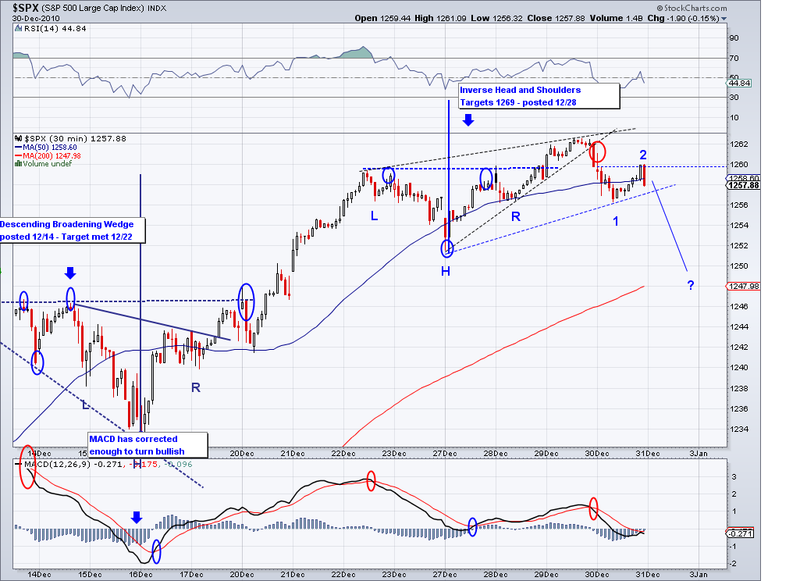 They forecasted 1275 for 2010 and I think might just be on the money by Dec 31st. Seems to me like Bernanke is ready to print more money which equals higher equity prices/asset prices. The market refused to go down today despite the obviously bad news on job creation. And prior to the announcement the EMinis had made a high for the year, so I think a higher high for the year is now a given. The fact the market refused to dive and traded sideways was an indicator of lack of sellers and enough buyers who believe we are going higher. I am holding short but I went hedged this morning at 1219, I was actually able to pick up my FXI at a cheaper price than when I sold them at 1205 so it works out in the end. 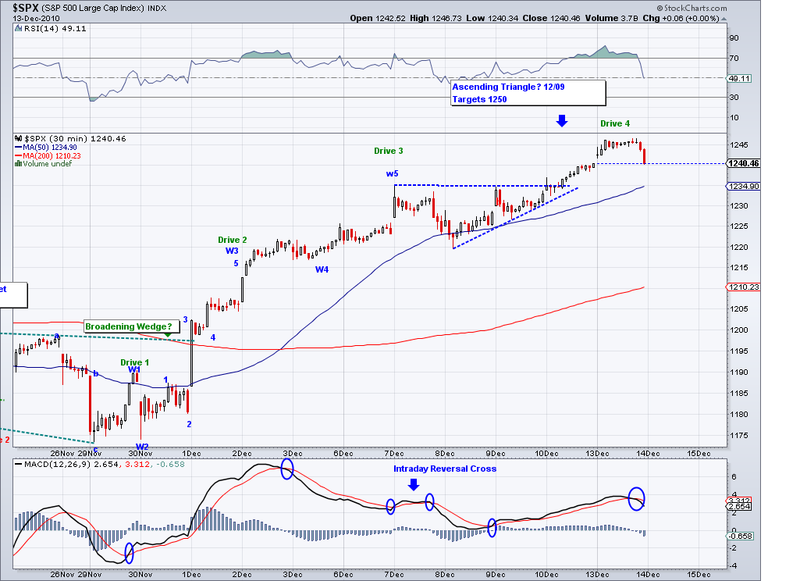 The bearish MACD cross, the overbought RSI and this morning my confirmation for entering shorts all failed. So it goes to show this rally is just barely getting started. 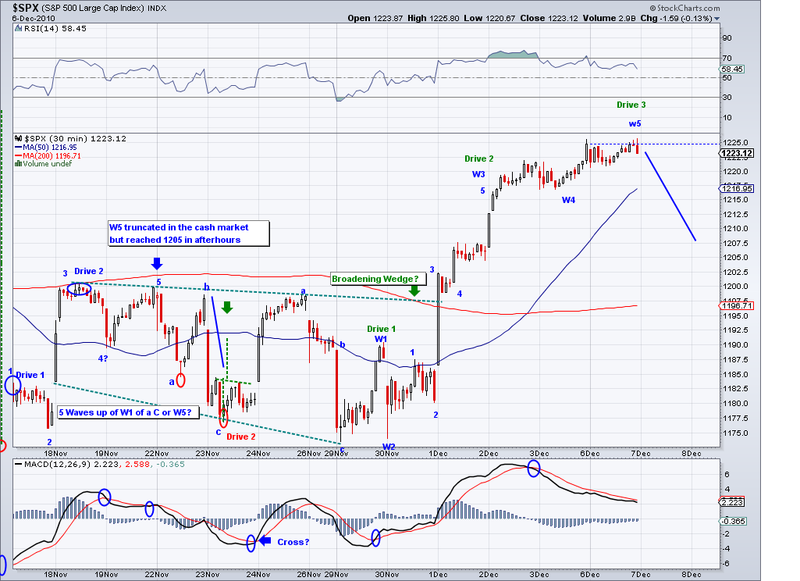 With that said, we should get a pullback to the 1200-1210 area before going higher. Perhaps Monday will be the "delayed" sell off, either way I'll be able to sleep ok this weekend. 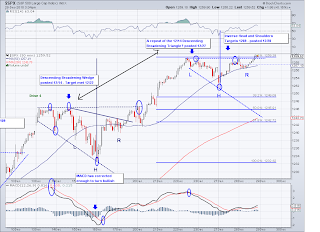 Market Update - December 2nd - Correction to 1200? So the market went much higher today and it is obviously gunning for 1227 to make it clear to those sitting on the fence we're going for a year end rally. And again, looking at the last time a break out happened, we had 3 huge straight up days before any meaningful pullback. Whether this will be the case this time remains to be seen. On the EW side, I see 5 waves completed and the technicals are all oversold plus we have a bearish MACD cross on the 30 min (which is the one I like to follow). However, there is one indicator I use (trendlines and different averages) that did not confirm so we might see even more upside tomorrow. Perhaps even one that will blast thru 1227 if the job reports comes in incredibly well or really bad (more QE). 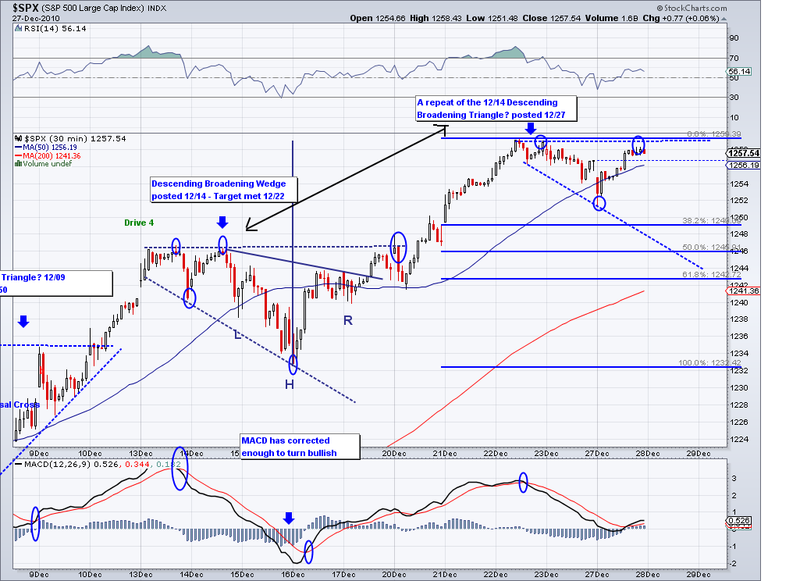 Ideally, I'd like to see a correction to the 1200-1210 area and then resume the march to 1250. I made a mistake today in going short at 1212 and if I get caught off guard by a gap up it will be due to my own impulses and not because of my trading system. I've been honing my analysis over the last year and I'm getting better at shorting which is a highly risky strategy. 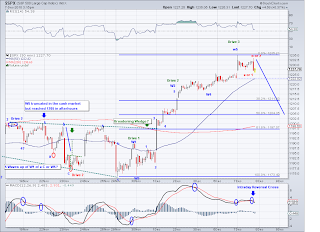 So I am praying we get a retrace tomorrow to test the level I watch which is around 1198 as of today. So the market today broke out of the pattern as I was speculating yesterday we would do and the strong up day confirms a Triple Bottom Reversal. In looking at the chart I posted last night, you can see the similarities. The last time we had a strong up day like today was September 1st, which was the break out from the triple bottom then. And I expect the market to continue upwards in the next few days. I sold my longs at a nice profit at the close and shorted and closed right away. I almost kept my longs overnight but I figure I rather lose a trading opportunity than actual profit. 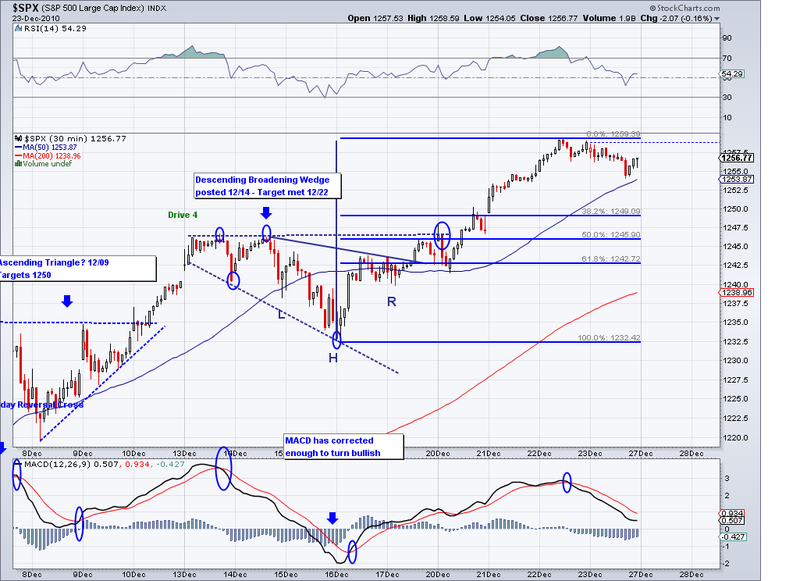 If the market tests the rising trendline or does a Fib retrace I will get back my long position. Right now, I see 5 waves completed of a W3. 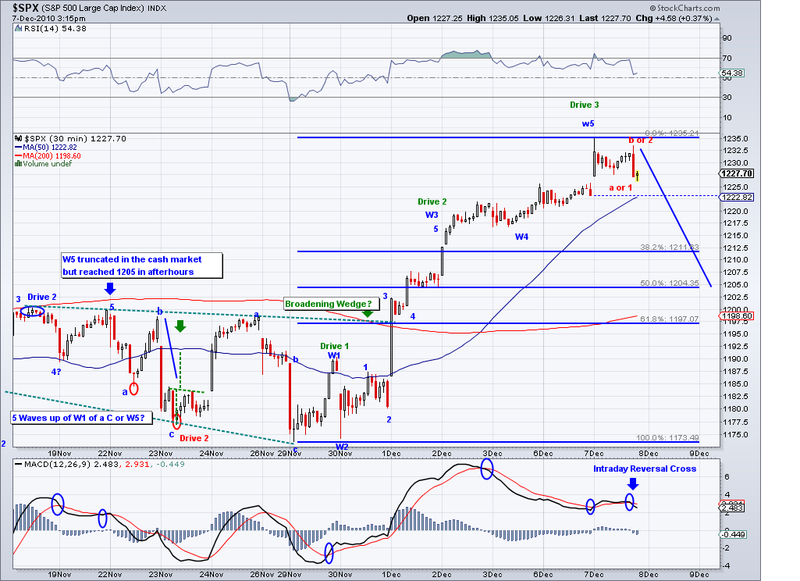 So tomorrow we could trade sideways and then continue upwards or a retrace and then up. 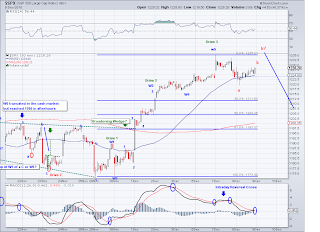 The retracement or sideways move could also happen overnight so we might wake up to a gap up as well. 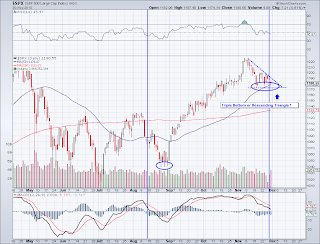 Market Update - November 30th - Triple Bottom or Descending Triangle? 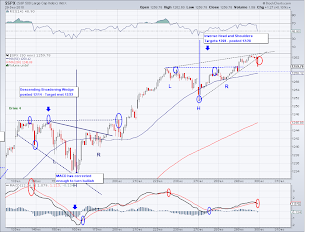 The market tested the low yet again but the market will break out of this range very soon. Basically, this could turn out to be a Triple Bottom or a Descending Triangle. I am personally leaning towards the Triple Bottom scenario and trading as such. My stop is simple, I will get out of longs if 1172 is breached. 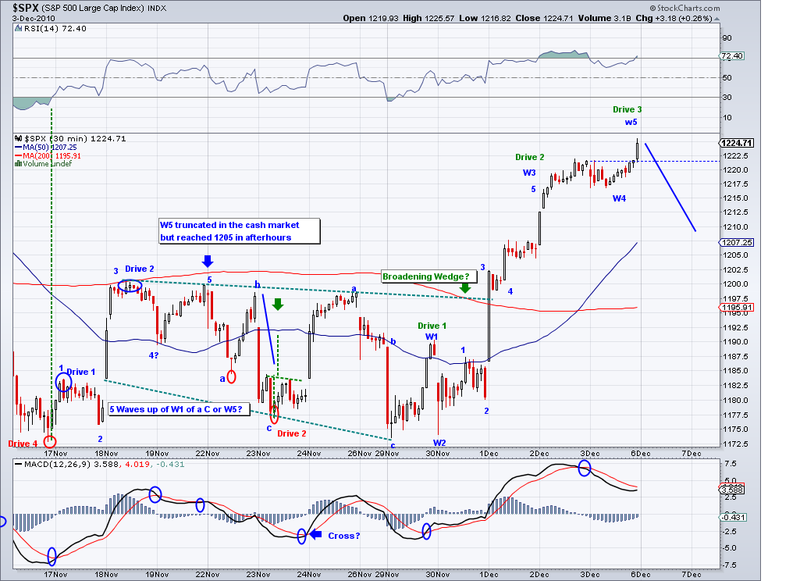 At this point there should be a 5th wave left in the rally from 1040 that should take us to 1250 but first 1190. We'll soon have the answer.